Here is a list of personality traits or character traits: Listener, Respectful, Co-operatve, Anxious, Patient, Impatient, Calm, Social, Responsible, Athletic, Thinker, Organized, Polite, Determined, Happy, Talker, Risk Taker, Energetic, Follower, Careless, Comical, Relaxed, Problem Solver, Leader, Tidy, Nervous, Helpful, Independent, Committed, Dedicated, Obstinate, Unique, Learner, Devoted, Curious, Understanding, Moody, Reasonable, Relaxed, Ambitious, Friendly, Creative, Athletic, Depressed, Witty. 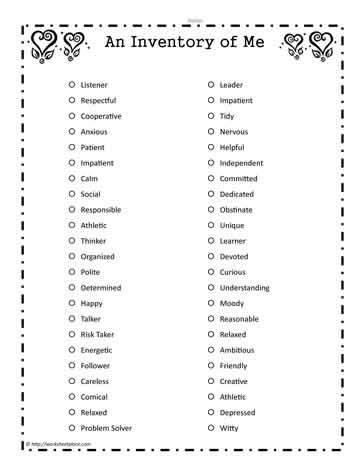 From this list of traits, which traits do you like to see in others? What do you like to see in yourself? Which traits are good to have? Which traits aren't so good? Which traits do you need to work on? Use this inventory of traits to help you decide what you need to work on.